His winning smile displays his passion for fitness and body sculpting. JC comes to AllAmericanGuys from the state of Iowa. He's a former baseball player and all around athlete. 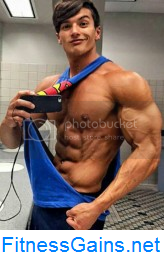 JC recently got into developing his physique and entered his first fitness show (Arnold Classic) in the Winter of 2013. Says JC "I have always admired how the guys look the way they look, and enjoyed learning the nutrition and training and hard work they put into it,” said JC, referring to the models on fitness magazines. He’s a huge fan of IFBB Pro and sponsored athlete, Steve Cook, and the world’s number one fitness model, Greg Plitt. Both of whom he considers a great inspiration. You find many high quality photos and videos of JC here on AllAmericanGuys. Similar to planning a bodybuilding workout schedule, it is important that you always have a diet plan to perfectly compliment your current workout regime; bodybuilding can be very intense so it is essential that you always have the energy to maintain your stamina and strength throughout a workout. The easiest way to do this is by balancing your diet to sustain you for both your bodybuilding session and the remainder of your day. Due to the intensity of bodybuilding you will find your diet has to vary slightly from the standard diet of somebody who doesn’t body build, however it is a worthwhile change to make if you wish to maximise your hard work when building your muscles. Knowing where to start when choosing a diet plan to compliment your bodybuilding can be difficult. There are a lot of suggested diet plans for bodybuilding and obviously not all of them are right for you, so spend some time considering the nature of these diets and the aims that you have as a bodybuilder and then take it from there. Consider how often you work out within a day and a week, as well as what other activities you take part in and the commitments you have, this allows you to consider the stage of bodybuilding you are at and where you intend to go with it to determine what diet plan will suit you the best, whilst also giving you the energy for the rest of your daily commitments. There are a range of different diets that can help a body builder to gain muscle; firstly however it must be determined whether fat loss is needed, or whether it is just muscle gain. If you have over 10% body fat you will want to find a diet that helps with fat loss, if your body fat percentage is below 10% then you will want to follow a weight gain or bulk-up diet. When choosing a diet it is important to always be aware of any health conditions or issues with diet that you may have, there are a range of eating disorders that many people suffer from and these can be worsened by certain habits or other problems, so paying careful attention to your past when choosing a diet plan is essential to ensure you get the best results possible and do not harm your body. As long as your body is healthy you will find a specialised diet plan for bodybuilding could make the world of difference to your success. • The Beginner’s Bodybuilding Diet – This is ideal for anyone who has not been bodybuilding for long as it allows you to gradually make changes to your diet to help with the bodybuilding. Initially you will cut your fat intake over the first two weeks of the diet change, after this in weeks three to four you will eliminate refined sugars wherever possible. During weeks five to six you should attempt to make water your main drink as well as increasing how much water you drink. After these weeks of diet change have taken place you can move onto something even more beneficial such as the options listed below. • Fat Burning Bodybuilding Diet – A diet that is fat burning is a very good place to begin after you have undertaken the beginner’s diet, especially if you have a decent amount of body fat as it helps to lower the body fat percentage and build muscle. To follow this diet correctly you should have smaller meals more frequently throughout the day; 6 meals a day as well as plenty of water should be ideal for most bodies, aiming for 40% carbohydrates, 40% protein and 20% good fats in each meal to maximise fat loss and improve muscle gain. • Muscle Weight Gain Diet – This can be a difficult diet to get right. It involves increasing your protein, carbohydrate and good fat intake by a percentage of your bodyweight. Getting this right can take some effort as it is easy to incorrectly balance both your training and diet to burn off excess fat, making fat gain a possible risk as your intake has increased. If you are unsure, seeing a professional could help you determine what is best for you, in essence this diet is very similar to the last but requires much more pre-planning and dedication to get it right. • Competitive Bodybuilding Diet – As the name suggests this form of diet is intended for bodybuilders who are aiming for competitive bodybuilding. It usually consists of a similar dietary split as the other diet options in terms of protein, good fats and carbohydrates, but it includes 8 meals a day as well as supplements to help with muscle gain and fat loss. A professional should be consulted for this diet type to ensure you are not harming your body and are gaining the most out of it as is possible. Having the right diet to match your bodybuilding regime can massively help you to bulk out, lower your fat level and maintain a high level of energy throughout the day. It can also prepare you for competitions and will help to keep your body at a good, healthy level of balance. About the author: After graduating in Food and Nutritional Sciences, Lisa Holmes began working as a nutritionist. Now she works from home as a freelance writer and covers topics as diverse as the latest in health research, green food production, family nutrition and health, living with conditions and health education.